We can't thank you enough for helping us land our dream home. You have been fantastic throughout the buying process. In fact the day we met you at one of the open houses some how you made us very comfortable and walked us through the painstaking and time consuming ordeal of house hunting. At this level it takes a right balance to trust the buyers and give them enough space and give them the right advice to nudge and push without over doing it as it may leave the buyers with a buyers remorse for life. We can't appreciate you enough and we will have you in our heart for making our dream come true. You also made our life easier by taking the responsibility to sell our house in Cupertino. We watched from the sidelines on how you went through your process to get the house sold in a week's time with a record number of offers. No wonder you are the best in what you do. Keep up the good work to fulfill such dreams to other potential buyers out there! Kitty, Just wanted to thank you for all your help. I am loving it at the new home. Please come visit us sometimes may be with your boys. I will refer you to all my friends who might be interested in buying/selling in the bay area. Thanks so much for all your help and indeed you have done absolute thorough work and we think we got the best agent possible. Kitty helped us look outside the box and find our dream home that we are confident will be a phenomenal long term investment. She aggressively sold our home as-is with little effort on our part. She gave us peace of mind by selling quickly over the slower holiday period. We would highly recommend Kitty for her astute attention to detail and strong negotiation skills. She was a great listener and showed extreme commitment to meeting our goals. She is a true professional and a quality person. Thank you Kitty! Kitty will sell your house promptly, and she will get your price. In my transaction, I wanted a certain minimum price. Rather than leave room for negotiation, she recommended that we set the asking price at the price I wanted. She very professionally told the prospective buyers that "we have set the price at an attractive level, and the seller will negotiate anything but the price." We sold my house at the price I wanted in a lousy housing market in the middle of January in less than 40 days. Kitty is knowledgeable, pleasantly persistent and very resourceful. I strongly recommend her as a highly qualified real estate agent. Wanted to thank you for everything.. Here's from the bottom of our heart - Please feel free to use us as your reference. "Kitty helped us with our move from Virginia to California. We can't praise her enough for the tremendous job she did making our purchase very smooth. We came across her profile on the internet a year ago and without any references, took a chance and started interacting with her. We were very impressed with her passion and professionalism and how well she communicated with us. For almost a year she counseled us on the various options and sent us updates on the market and prompted us to act at the right moment. She understood our needs and constraints and negotiated an excellent price for our purchase in a great location. Through the entire purchasing process, she stayed on top of things, acted as an expert counselor and guide balancing professionalism with warmth and personal touch. We will not hesitate to make use of her services again and would recommend her highly to anyone who wants a top notch service with utmost professionalism and courtesy"
It is our pleasure to recommend Kitty Mora as a realtor. We worked with Kitty in purchasing our current home in Saratoga. She is a great listener and judge of value  after briefly meeting Kitty in an open house and discussing our needs and criteria, she began showing us homes that were great values, tasteful, and wholly consistent with our needs. Throughout our rather extensive search process, she was consistently professional, timely, and proactive, as well as a pleasure to get to know in the course of our search together. Our purchase was finalized in a time of significant market turmoil. With Kittys help we found a once-in-a-lifetime home purchase opportunity, a house that in other circumstances would have been beyond our means. 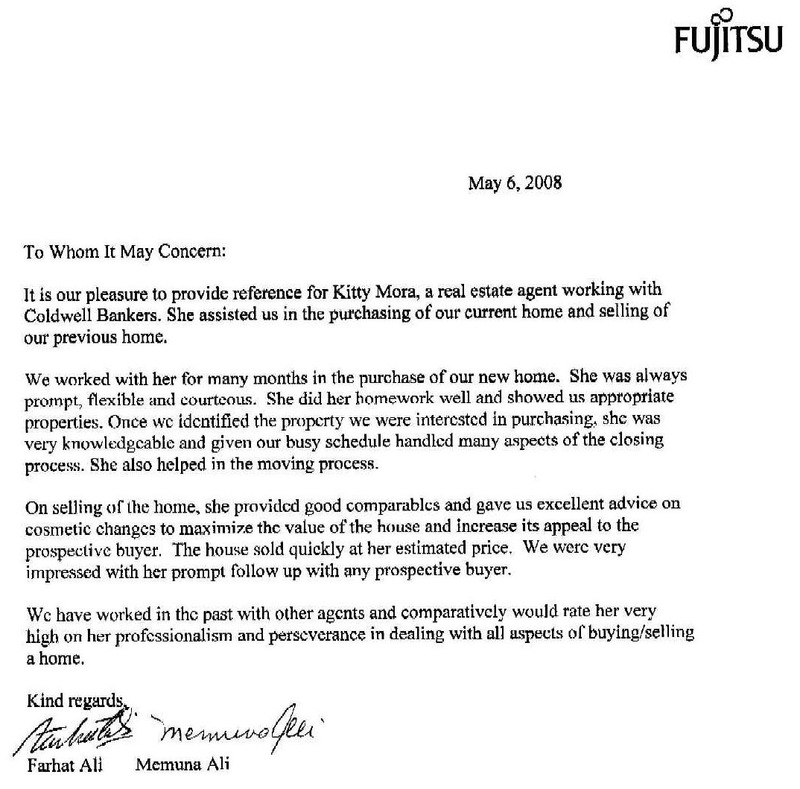 Through Kittys persistence, research and navigation through the series of deals required to make the purchase happen, and skillful negotiation, we were able get the house and then in a short time frame secure financing and close escrow. Every day that we come home to this beautiful home, we are grateful to Kitty for her role in making the purchase possible.